Celebrating its 83rd year, this is Atlanta&apos;s oldest fine arts festival. For three days, kids and adults alike can enjoy food, live music, more food trucks than you can stand, a kids village, an artist market, and of course dogwoods. Attendees can purchase sculptures, paintings, pottery, jewelry, photography and other art during this staple Atlanta event. At its core, this festival is all about music, beer, and the environment. Happening every Earth Day weekend, Sweetwater 420 Fest brings live music, comedy, art, food, workshops, and brews to Centennial Olympic Park. There&apos;s. even. a. disco. What started as a small celebration 15 years ago by Georgia&apos;s native Sweetwater Brewery has now evolved into a weekend bash appreciating Mother Earth and all the good thing she has to offer the world. In Dunwoody, we believe when life gives you lemons, you should make an entire festival out of them. In 1998, a F2 tornado tore through Dunwoody at 150 mph causing much disaster and devastation through our beloved city. Not long after, the community banded together to create Lemonade Days, a charity event designed to bring relief to those families affected by the tornado. 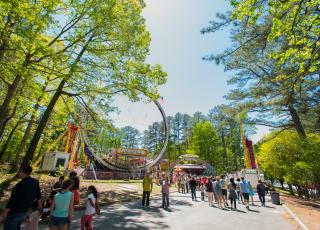 Now in its 20th year, it is a five-day festival complete with more than 30-full scale carnival rides, more than 20 food and beverage vendors, a 5K run, a Made in Dunwoody Country Store, an antique car show, a petting zoo, and lots more if you can believe it! This tragedy-turned-triumph has blossomed into a family festival that brings out more than 80,000 festival-goers - but there&apos;s always room for plenty more. Check out some highlights from last year&apos;s event, and save this $5 off unlimited rides coupon for this year! This 3-day festival earned the No. 4 spot on USA Today&apos;s 10Best Reader&apos;s Choice Music Festivals list, and was also listed as one of the 50 Must-See Music Festivals in Summer 2015 by Rolling Stone. Featuring both world-renowned acts and up-and-coming artists, the Shaky Knees Festival is Atlanta&apos;s proper indie music showcase comparable to Coachella and Bonnaroo. Just "smaller." And more enjoyable (if you ask us.) We say "smaller" because this baby still brings out at least 40,000 people in only its 5th year. The Dunwoody Art Festival is a Mother&apos;s Day tradition now celebrating its 10th year! Over 40,000 grandmothers, moms, kids, and dads come out for this whimsical artist market that continuously attracts top artisans from all over the country. Often labeled as a "shopper&apos;s paradise," this festival is the perfect gift and the perfect place to find gifts. Complete with a Festival Food Court, a relaxing stage with continuous live music, and a Kidz Zone, this festival is fun for kids age 1 to 92. Sweet Auburn Spring Fest is the largest free outdoor festival in the Southeast. It takes place in the historic Sweet Auburn District - home to Ebenezer Baptist Church where Rev. Martin Luther King Jr. preached, his birthplace, and the APEX museum. The festival offers a mix of live music, food, and fun for the whole family with a rich, historical Atlanta neighborhood as the scenic backdrop. Atlanta is home to one of the nation&apos;s largest free jazz festivals. Held each Memorial Day weekend, the festival itself is preceded by 31 days of memorable jazz performances and exciting events scattered throughout the city to capture the hearts of seasoned and new jazz afficionados. The festival has three stages: the contemporary, legends, and next generation stages and is lined up with performances starting from midday to late night. Over the years, the Atlanta Jazz Festival has featured musical legends such as Miles Davis, Dizzie Gillespie, and Nina Simone. Attendees can explore beautiful Piedmont Park while visiting vendors displaying some of the city&apos;s finest arts and crafts, food and drinks, and merchandise. Imagine a weekend festival devoted to Southern cuisine. You don&apos;t have to imagine it actually, because it already exists. Featuring more than 250 restaurants, artisans, chefs, and producers, this festival offers exclusive food and wine tastings from some of Atlanta&apos;s best restaurants. If you call yourself a foodie, this is your festival. Whether you&apos;re looking for food, music, art, or just plain &apos;ol fun, Atlanta&apos;s got you covered this spring. There are so many other festivals not mentioned here, taking place downtown and around. You should spend all season checking them out for yourself. Not sure where to start? How about here. We&apos;ve got festivals centered around lemonade, art, and even butterflies later on this year.